Fill in the areas containing a dot with one color, then fill in the rest of the areas with different colors. From “Sweet Power of Prayer,” Ensign, May 2003, 7. Elder Russell M. Nelson of the Quorum of the Twelve Apostles shares some of his thoughts on this subject. We may pray to Him any time. Prophets have long told us to pray humbly and frequently. Prayers can be offered even in silence. One can think a prayer. A loving Father in Heaven wants to hear from His children. Through prayer, we can show our love for God. We pray privately, with our families regularly, at mealtime, and in daily activities. Jesus revealed that we pray to a wise Father who knows what things we have need of, before we ask Him. 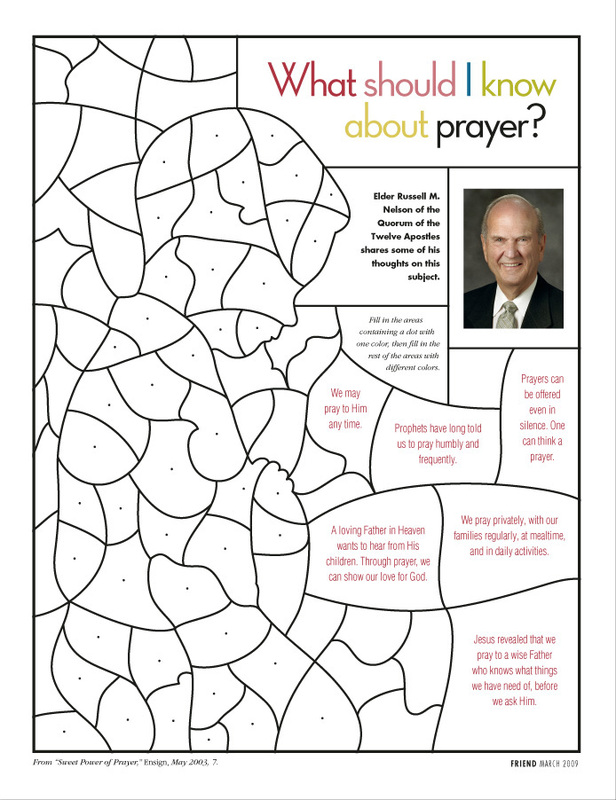 Filed under: Lesson 34: We Can Pray to Heavenly Father, Elder Russell M. Nelson, Lesson 34: We Can Pray to Heavenly Father, pray, prayer, What should I know about prayer?